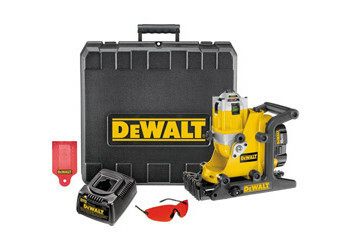 Dewalt Heavy-Duty 18V Cordless Rotary Laser Kit. Manual leveling system is accurate to ±1/4" per 100 feet. Multi-voltage adapter accepts all DEWALT batteries 9.6V-18V. Dual side-by-side laser diodes for an extremely bright, visible beam. Protected rotary head & side impact roll cage for increased durability. Built-in wall, floor and tripod mounts allow fast and easy setup for most common applications - eliminates need for separate tool mount accessories. Variable speed, 0-600 RPM for increased visibility. Two-position pivoting head for quick adjustment from level to plumb. Built-in bump sensor alerts user if laser has been bumped after leveling.